How many of you knew that Shaman’s were well known throughout the world, in many other cultures not just Native America? Known for their healing prowess and ability to banish bad omens from tribes, Shaman’s were revered and protected. Boku Slots enjoyed the layout of this slot from Eyecon, because Shaman’s Dream is a beautifully drawn slot taking inspiration from the American Indian culture. 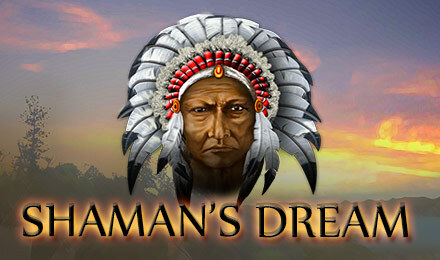 Shaman’s Dream is a 5-reel, 25 pay line slot offering an RTP of 95.4% to its players. The background is a misty scene, set against the back drop of Teepee’s and mountain ranges. There is the odd background sound here such as a wolf howling, but not much else happens within the game sound wise to keep us interested; so we turned it off. Symbols within the game are atypical of the theme, such as tomahawks, a dreamcatcher, eagles, a squaw and the Chieftain. Bet Amounts – Betting begins at 25p per spin with all lines active and can be increased to £50 per spin with all lines active. You can adjust your bet up or down according to the amount of lines in play and to the value of the line bet amount. Wild Symbol – A lone white wolf is your wild symbol and this dangerous creature will substitute for all other symbols, except the dreamcatcher scatter. Land a wild as part of a line win in the base game to have that win doubled. This symbol is also your highest paying within Shaman’s Dream. If you land 5 of these on an active pay line, you will land a win of 9500 coins. Scatter Symbol – To trigger the bonus spins you first need to land 3 or more of the stunning dreamcatcher scatter symbols anywhere on the reels. As well as triggering the bonus you can also receive scatter wins on top of the line win. Scatter wins pay out if you land 2 or more symbols anywhere on the reels in Shaman’s Dream. Bonus Spin Features – Once you have landed three or more scatters, you will be allocated 15 bonus spins to play through. Any prize won during the bonus round is given a x3 multiplier and if a wild symbol forms part of the win, it will then be doubled again. As well as that if you land three more scatters you can re trigger the round up to a maximum of 15 more times, that’s potentially 225 spins you could be playing through! 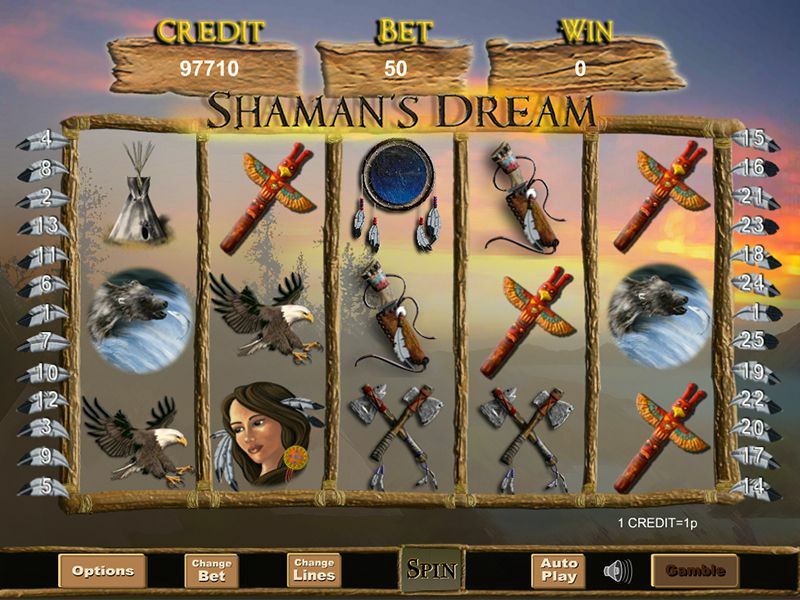 Shaman’s Dream is at best a plain and simple slot game. It doesn’t take much to figure out the way it works, and it isn’t too taxing on the brain. However, you would think this would make it a little tedious to play. Not the case at all, we had a great time with this slot. Mainly because once those bonus spins kick in, your luck is in and you get to retrigger them again and again. There definitely could have been more done with the game feature wise, but Eyecon has done the right thing with less is more!